Throwers of the East Kingdom, will you be at Pennsic? Come and try out to join the TW Champions’ War Point Team! There will be tryouts for the team on Sunday, August 5 at 5:30pm (sign-ups starting at 5:00pm). – Tryouts will include ax, knife, and spear. Please bring what you need, or arrange to borrow before you come up to the range. – No practice throws on the tryout targets. There might be a practice range open, but there might not be (depends on marshal availability). – Each thrower gets one round of tryouts; nobody gets a second round. – We must be off the range at dusk. If you have an interest in being on the team, come out and throw! We have 11 positions to fill (our beloved King’s Champion will be skipping Pennsic this year unfortunately) and our Allies will also be trying out for the team this year. We do not know yet how many spots will be open to the East, but we want the best throwers out there. We will also have spots for a few alternates. So please, come on out and throw and help us win this year. The top 16 competitors in King’s and Queen’s Thrown Weapons pose with the outgoing champions and Their Majesties. 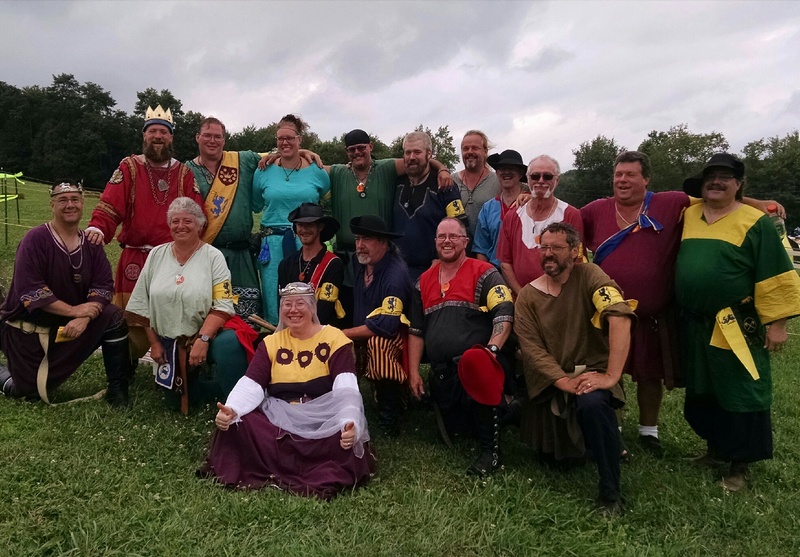 The King and Queens Thrown Weapons Champion Tournament was hosted by Panther Vale and run over a 2 day period with Saturday and Sunday morning giving would-be competitors up to 3 chances to register a straight 24 throw royal round score. 25 people put in approximately 50 royal round scores total to vie for the titles. The top 16 competitors were then asked whether they would, if victor or chosen, be willing to take the honor and roll of either Queen’s or King’s champion. Everyone competing answered in the affirmative. The tournament was broken in to 4 rounds. The first two rounds were conducted as a head-to-head competition at “the wall”. The wall consists of 9 sequential progressively smaller targets placed at varying heights on a 5’ wide by 8’ tall plank wall. This is designed to challenge not only a contestant’s aim but their ability to make range adjustments under pressure. The first 6 targets had a bonus area allowing a competitor to skip the next target if hit. Wall rounds consist of two phases (one axe, one knife), with the first round thrown at short distance (10’ minimum). In the event that competitors split the phases, the victor is decided by a “spear-off”; a crowd favorite consisting of another head to head challenge of first competitor to hit the central 10” target with a spear at 20’. The remaining 8 competitors went to round 2 at the wall where they were allowed to choose short or long distance throws. Every competitor chose long distance (20’ minimum). The rallying cry at the wall was “NOT ZERO” which became a crowd cheer. Round 3 saw 4 competitors (Matteo Genovese, Kazimierz of Carolingia, Symon of Barnsdale, and Jesse of BBM) . The premise was another head-to-head competition. Two targets were brought out with X’s marked. Each competitor was to throw two of each weapon type (axe, knife, and spear) at short range with each score measured in inches from the center of the target. The goal was to measure consistency. A miss was scored as an 11. After each pair of throws, competitors switched targets to negate any inconsistencies in the target faces. After 12 throws, the measurements were totaled and the lowest advanced to the finals. The rallying cry from rounds 1 and 2 had to be modified to, “NOT NOT ZERO!”. If round 3 was measured in inches, round 4 was measured in feet. Given that our former Queen’s champion has pre-SCA experience with javelin, the challenge was accuracy over distance. The format was simple. The Queen’s champion, Bryon de Burgh cast a spear at a distance of his choice, which due to range limitations was about 70’. The finalist were to cast their spears as close to as possible to the set mark and their distances recorded. A competitor’s distance was reduced by a foot if they also managed to get their spear to stick in the ground. After Bryon, Her Majesty then cast Her spear, the distances recorded, and finally His Majesty placed the mark. Though close, the ultimate victor and new Queen’s champion went to Matteo Genovese. King’s Champion is awarded by proclamation, with His Majesty giving consideration to not only performance of the 16 competitors, but comportment, spirit, and sportsmanship. From this writer’s perspective, this presented a challenge for His Majesty as every competitor brought their best game and competed with honor and great fellowship. In the end and after considerable deliberation, the honor was awarded to Þórormr Barnakarl. The deer in the headlight look was priceless but the honor well deserved. The Gazette thanks Syr Cedric of Thanet for sharing this perspective on the competition. On July 6-9th, the Province of Malagentia hosted the Great Northeastern War XXXI which included the East Kingdom King’s and Queen’s Thrown Weapons Championships. The championship brought throwers from the Kingdom’s many regions to compete for the honor of becoming King’s or Queen’s Champion. This year’s championship was deviously designed by Matteo Genovese of Quintavia, Queen’s Champion and Magnus the Broken of Hadchester, King’s Champion. Qualifiers to enter the championship consisted of a royal round thrown without breaks between distance or weapons forms with multiple chances to qualify. Twenty five people threw qualifying rounds from Thursday evening through Saturday morning. Of the twenty five, the top sixteen were chosen to compete in a bracket. Arnulf Tête de Laine d’ Saint Aubin was inducted into the Order of the Gawain. Rodulf d’ Saint Aubin was inducted into the Order of the Gawain. Scroll by Sorcha Dhocair inghean Uí Ruairc. Ysabella DeCoventry received her Award of Arms. Scroll by Aaradyn Ghyoot. Tiernan Shepard was awarded a Burdened Tyger. Scroll by Aesa Lokabrenna Sturladottir. Wynefryd Bredhers was awarded a Burdened Tyger. Calligraphy by Mari Clock van Hoorne. Brenden Crane was inducted into the Queen’s Order of Courtesy. Rufus Bowie, Sile ingean MacCarthaigh, Nest verch Tangwistel, Dearbhorgaill ingen Rosa, Alys Attewater, Marguarite von Elfaneu, Amy ferch Richard. Nejla Hatice Saime Dogan was granted a Court Barony. Colin MacKenzie stepped down as EK Thrown Weapons Marshal, and Leon the Navigator stepped into the position. Magnus DeLondres was declared the Queen’s Thrown Weapon Champion. Scroll by Charis Accipiter. Kazimerz was declared the King’s Thrown Weapon Champion. Scroll by Jonathan Blaecstan. Randal of the Dark was declared King’s Equestrian Champion. Scroll by Kayleigh Mac Whyte. Duncan Kerr was declared Queen’s Equestrian Champion. Scroll by Kayleigh Mac Whyte. Juan Lazaro Ramirez Xavier was inducted into the Order of the Pelican. Scroll by Eleanore MacCarthaigh. Siubhan Wallace was inducted into the Order of the Pelican Illumination by Lisabetta Medaglia Calligraphy by: Eleanor Catlyng. Curia Agenda for March 28, 2015/Ordre du jour de la Curie Royale du 28 mars 2015. ≈ Comments Off on Curia Agenda for March 28, 2015/Ordre du jour de la Curie Royale du 28 mars 2015. The next East Kingdom Curia will be held at Mudthaw in the Barony of Settmour Swamp (Stanhope, NJ) starting at 10:00 AM on Saturday, March 28. Full event details can be found in the announcement on the East Kingdom web site: Mudthaw Event Announcement. Long time attendees of the event will want to check the directions, as the site has moved this year. Despite the continuing intermittent rain and resulting scheduling changes, Pennsic continued in full swing on Thursday, with the East continuing to fight valiantly and victoriously. The Thrown Weapons war point took place in the morning, and won by the East. Thursday’s scheduled Bridge Battles were replaced by a broken field battle worth 5 points, all of which were won by the East. The Ruins battle for Rapier fighters was held as scheduled Thursday afternoon. All three points for this battle went to the Midrealm. A siege weapons war point was also held on Thursday, which was taken by the Midrealm. The East was also awarded two points toward the overall Service war point. 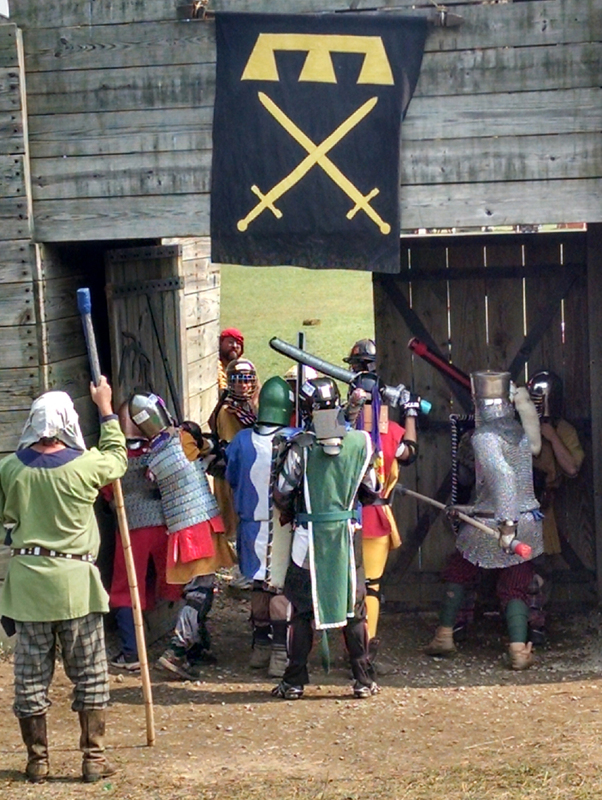 Friday’s scheduled events at Pennsic include the Castle Battle for armored combat, and the last day of the Populace War Point Archery. Closing ceremonies are scheduled for today at 2 pm.